Paws2Rescue have been helping the dogs in Iasi for quite some time. We have adopted dogs from the shelters and built partnerships in the County. 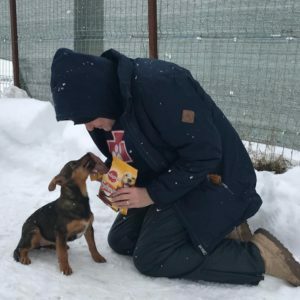 In January 2018 we went to stay in Iasi, and took time to visit the two public shelters with 1,000 dogs. With temperatures dropping to -17C during our trip, it was a difficult trip for us. Bitterly cold, and snowing almost all day too, we found the conditions difficult, yet it is worse for dogs. Seeing dogs laying on the snow shivering broke our hearts, some digging out holes in the snow to keep them warm, but what was far worse was seeing the pups. We thought how unfair life can be for a tiny pup, born unwanted as s stray, because people do not neuter their dogs. Iasi is better than other areas in Romania that we have been to, and the shelters do not kill at the moment, (although as they fill up, they will have no choice but to comply with the law and euthanise). Locals do adopt pups, but in the meantime, conditions at the shelters are no good for pups, and the shelter conditions are still restricted by public funding. There simply is no money for vaccines. It costs EU7 (about £5.50) to vaccinate a pup against Distemper and Parvo, or EU15 (about £13) to vaccinate a pup against Distemper, Hepatitis, Parvovirus and Parainfluenza and Lepto. A small price to pay for saving a life. Why not hold a small fundraiser towards our Iasi Puppy Appeal and be a lifesaver.